A guide to climbing Huayna Picchu. What to expect and if it is worth it – pictures included. 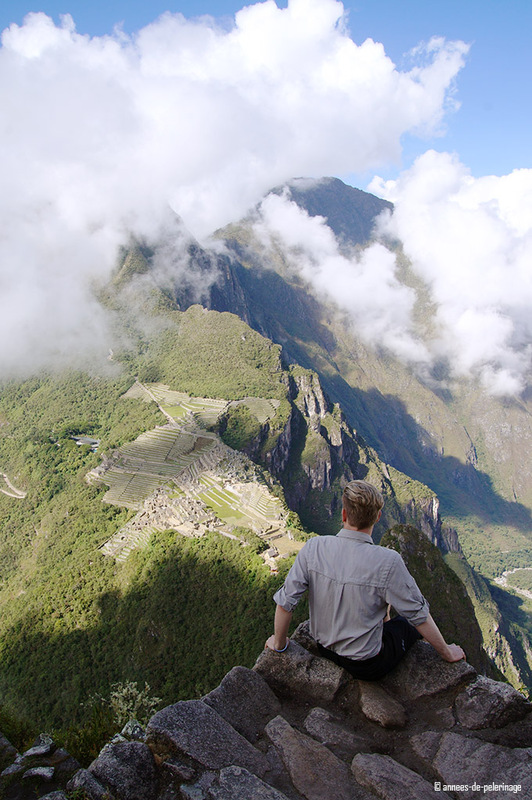 You’ve seen it before: The awe-instilling classic view of Machu Picchu. Maybe you even read my ultimate guide to Machu Picchu (if not check it out here). But what would be a picture of the New World Wonder without the ominously looming mountain behind it? Huayna Picchu it is called, sometimes also written Wayna Picchu and is Quechua for Young Peak. The luxury side of Machu Picchu: Read my Review of the 5 star Belmond Sanctuary Lodge right inside the famous Inca Ruins. There are a limited number of people who can climb Huayna Picchu each day: 200 in the morning and once again another 200 people close before noon. No ticket means no climb (I’ll speak more about that below). I had tickets for the morning, which entitled me to start anywhere between 7 am and 8 am. I choose to go as late as possible since it was quite foggy that day and really saw no point going earlier (I wrote about Machu Picchu’s dark side here). At the checkpoint, you will have to show your tickets and then write down your name, age and departure time inside a big book. Hence there usually will be a moderate queue that also helps to even out space in between the different traveler groups up the mountain. And then you are set and ready to go. There is only one path leading upwards so you really can’t get lost. If in doubt, follow the signs. Better be prepared: Check out my detailed Machu Picchu packing list. 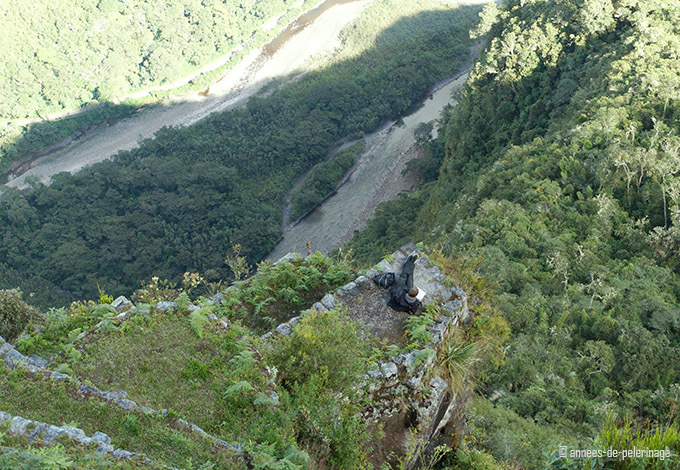 The approach to Wayna Picchu is treacherous. Right after the checkpoint, a nice and gentle semi-paved trail leads you through the dense foliage of the cloud forest and into believing: “This is quite the pleasant climb up”. A couple of meters onward the path gets a bit steeper and opens up to the sides, offering you a wonderful vista of the valley with the meandering Urubamba river below. Even those people suffering from vertigo will still feel considerably safe since the path is wide and even. The pleasant little interlude lasts approximately 10 minutes. Lulled into complacency this marks the last, non-sweaty moment of the ascent. What follows onwards is a very, very steep & rather scary hike. 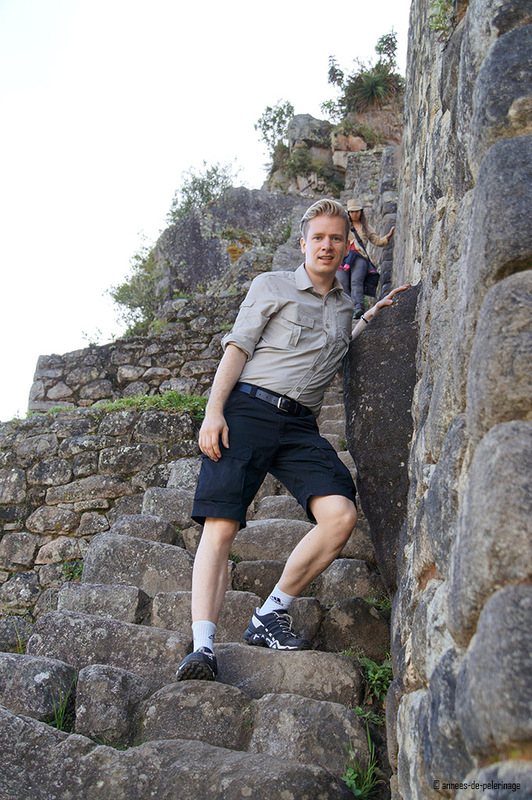 There are usually stairs and sometimes there is a handrail, but Huayna Picchu and the secrets of the Inca empire will not yield easily to you. In fact, the mountain is so steep that at a few choke points there was literally no space for a trail. So the Incas built narrow tunnels you will have to squeeze through. And with squeezing, I mean squeezing. Backpack? Forget it! You will have to shove that in front of you. It certainly will make you feel a bit like Hiram Bingham on his first expedition to the lost city of the Inca. And just because we are having so much fun: Here is another picture of the incline and yet another set of stairs. 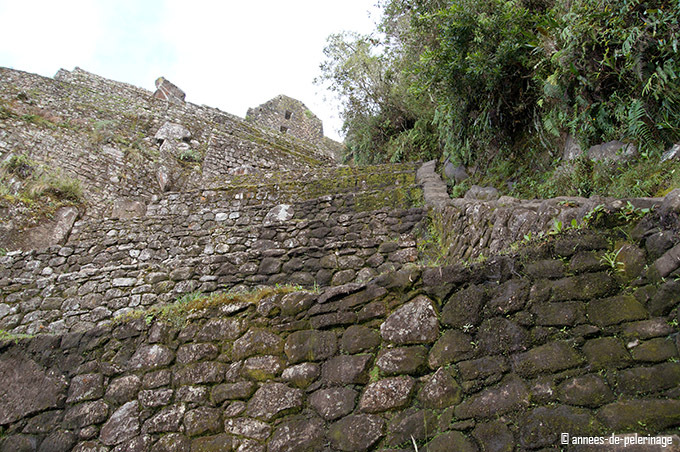 This is basically the way the upper half of Wayna Picchu looks like – buildings and a lot of stairs. 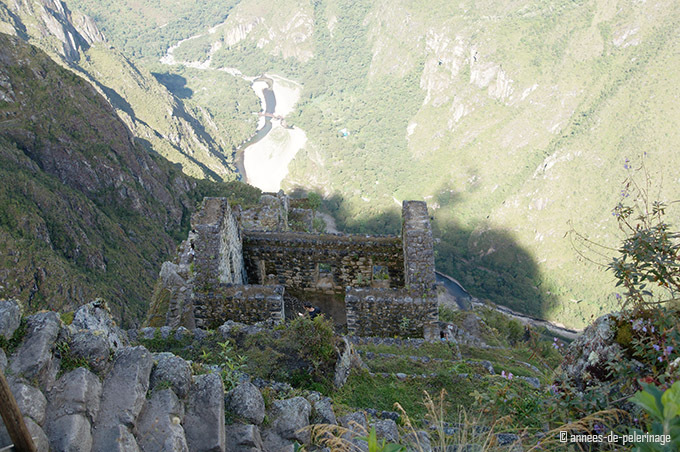 How the Incas managed to build anything here is beyond my personal comprehension – but there it is and up you go. Still looking for the perfect accommodation. Check out my list of the best hotels in Machu Picchu. 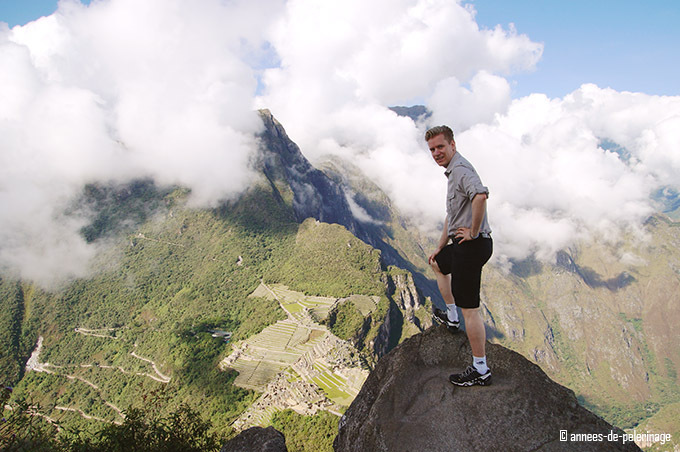 Either way, take your time around the 2.693 meters high summit of Huayna Picchu. There are a couple of platforms and landings that will give you a private moment. 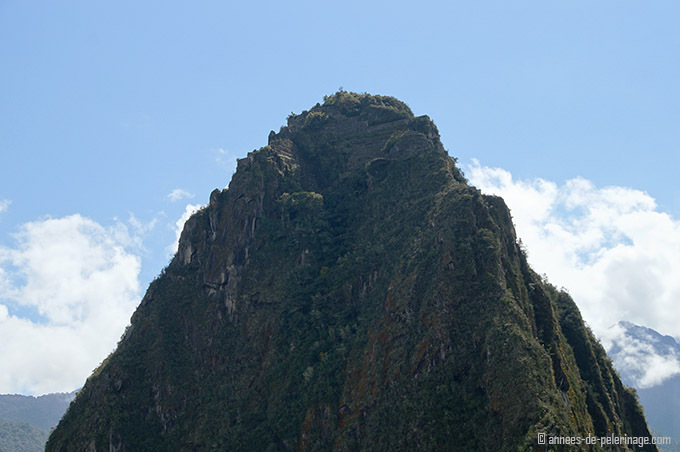 If you are wondering how high the other sites in and around Machu Picchu are, you should read this article (also covers the issue of altitude sickness!). Don’t make the mistake and wait for the peak with all your pictures. First of all, it can be cloudy by the time you reach it (like in my case; that’s the highest point I am standing on). But more importantly, the peak itself is rather…shall we say cumbersome? 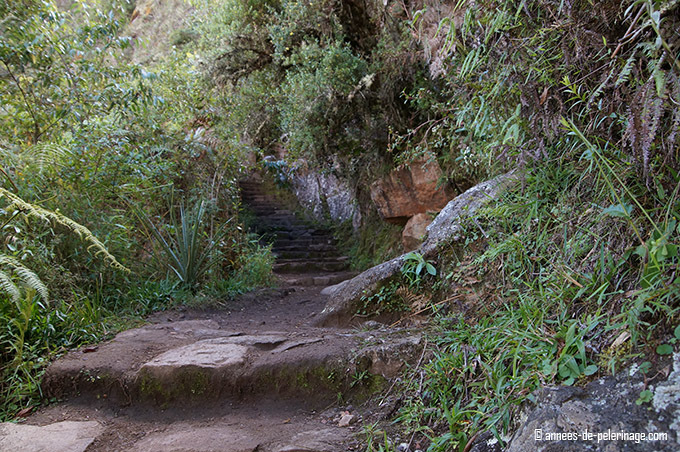 While a couple of meters below you will have the comfort of stairs and well laid Inca terraces, the peak itself is only rocks. These stones are in fact rather ugly to walk on (for inexperienced hikers, that is). So it’s not a place to dwell for long but rather something to move on. I can only imagine they would be very slippery in the rainy season. Especially since on the one side, you will face a near vertical drop. Nothing I personally can stand for too long. I saw this one guy reading a book on a lower platform. Relaxing or stress? I guess that depends on how well you can handle extreme heights and if you want to feel a bit like a condor yourself. What went up, will come down again. Simple logic? Not with Huayna Picchu! Climbing down is, in fact, the worst part of the otherwise wonderful experience. The trail takes a loop around the top so you will not come the way you climbed up. Here your first impression of the stairs of death. After your first meters, it will soon become apparent why exactly they are called stairs of death. The roughly hewn stonework follow an incline of 60 percent and more. They are so steep, it feels more like climbing a ladder. Looking to one side will offer a beautiful view of the near vertical drop and the impressive Urubamba valley below. Scary like hell! Your whole concentration will be just on the stairs and only on the stairs. You’ll feel like one misstep and your dead. Okay not at once – How long does it take to fall down a slope of 700 meters? Here is another picture of the stairs of death. At times the descend will be quite crowded with other trekkers, the stairs will be narrow, but if you take your time you will be just fine. And after all, stopping once every while to enjoy the breathtaking sacred valley of the Incas is its own reward. How did I handle it? I did okay. I wouldn’t say I suffer from vertigo. It’s more like a healthy respect for extreme heights and dangers. That being said the heavy mist of the morning hours made the steps quite slippery. So, for the few minutes down the worst part of the incline, I held on to whatever purchase I found. (as you can see there was time to take pictures – so the stairs of death didn’t bring me to brink of death). 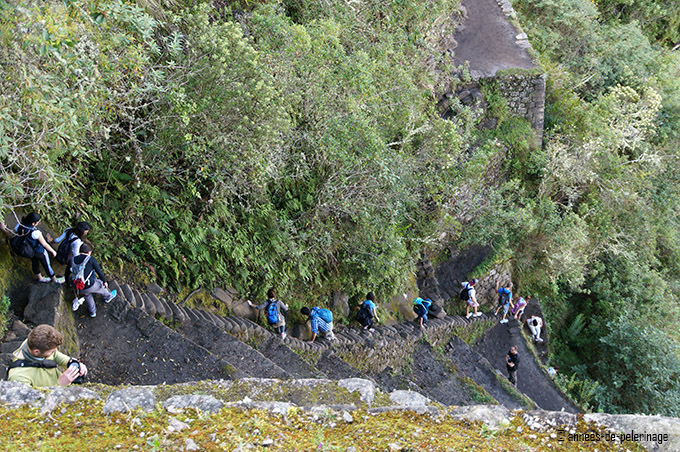 Last question: How many people have died on the stairs of Death in Wayna Picchu. Some. I tried to compile a list of all the myths and facts surrounding the stairs of death (read it here). One guy, for example, reportedly has been hit by a lighting. 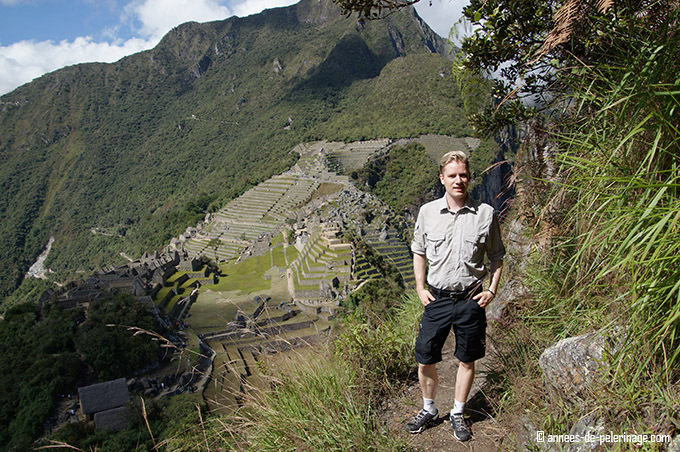 If you are looking to the side to the Wayna Picchu mountain it almost feels impossible to climb. That a way leads up, appears to be a World Wonder in itself. The lower half of the descent will be a piece of cake. Okay, never that. It will still be steep, and it will still be quite exhausting. You will already start cursing the stairs, the humidity, and the high altitude (again: roughly 2700 meters above sea level). But do not despair, but rather focus on the second highlight you should not miss: Huchuy Picchu. Huchuy Picchu is the little mountain right behind Machu Picchu. It’s only 100 meters higher than the ruins (almost the same height as the temple of the sun) so quite easy to climb. Why do you need to see it? 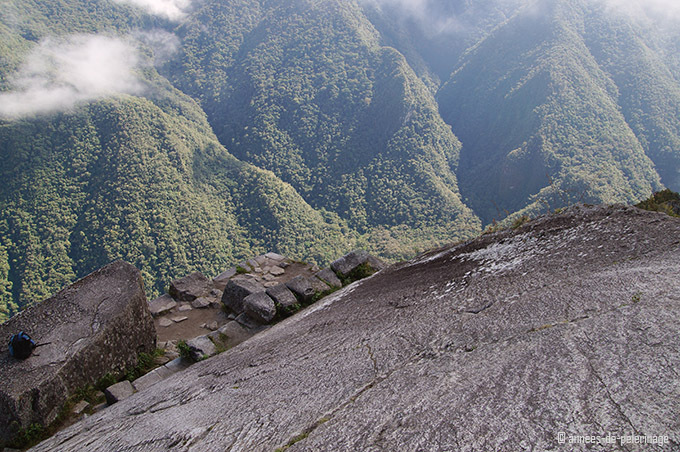 Quite simple: The view from Wayna Picchu is as staggering as the climb upwards. But for taking pictures Wayna is actually too high up (except you are carrying the biggest telephoto lens in history). How do you climb Huchuy Picchu? At one point, quite close to the checkpoint, the path branches off. 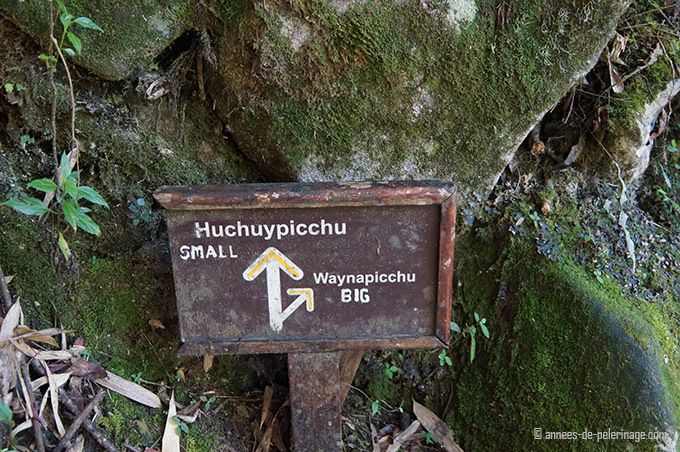 A little sign will tell you where to go (note: you will also frequently hear Wayna Picchu, it is the same as Huayna Picchu – just a different spelling of the original Quechua name). Expect some more stairs, the same kind of incline and the same kind of abyss to your sides. 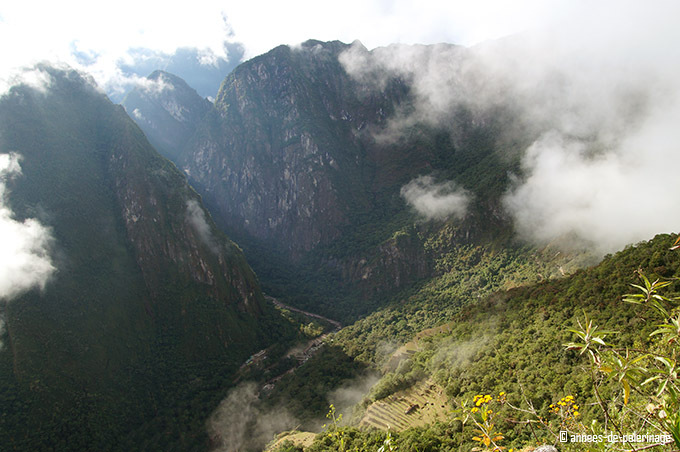 The beauty of Huchuy Picchu is also, that you will probably be totally alone there. 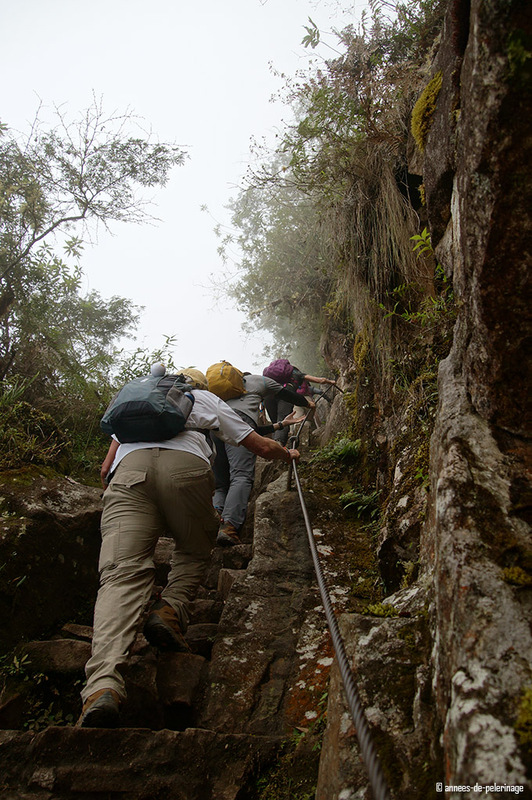 Most tourists focus on Wayna Picchu and then will be too exhausted for another climb. Time also is an issue, since you will need another 45 minutes for a round trip to Huchuy Picchu. If you are looking for beautiful pictures of yourself and the ruins close-up, then this is the place to go. I found it to be worth the extra time, especially since it gave me the chance to enjoy Machu Picchu in solitude. If you are looking for more special places in Machu Picchu, do read my review of the Belmond Sanctuary Lodge. The only place where you can enjoy the view of Machu Picchu sitting in a luxury hot tub. This is probably a question you should ask before you decide to go and before you buy tickets. Generally speaking, you don’t need to be a mountaineer or professional archaeologist, and they certainly don’t check for six packs at the entrance. But you will have to climb roughly 400 meters, with high humidity and at considerably high altitudes. Can you see the path up? No? It’s in the pictures, yes! Despite that, you should have climbed a mountain before and you will need a sure footing. Any extra fitness will help you along. But even if you’ll break into a sweat nobody will fault you. If you suffer from vertigo then you really shouldn’t go. The mountains are too steep for you to handle that. Just look at the picture and ask yourself: Will I be fine with that or not? Personally speaking, I’d say: Anyone very familiar with hiking can and should go. There are no ropes or railings throughout the hard parts of the climb and I would class it as a grade 4 climb (out of 5). This is fairly a common question because Machu Picchu is quite large. Obviously, the mountain is in the back. But other than that there are no general direction signs in Machu Picchu. They are not really needed, though. Just follow the normal walk-around (clockwise). At the far end of Machu Picchu, you will see two straw-thatched huts. Behind those is the checkpoint. How long does it take to the entrance of Wayna Picchu? Roughly 15 to 20 minutes from the main entrance – depending on the crowd. Tickets for Wayna Picchu have to be bought in advance. 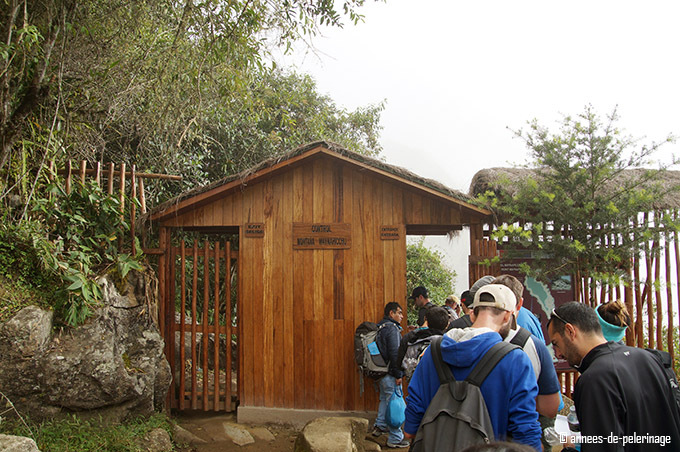 The official story is, that there is an official ticket office down in Aguas Calientes and Cusco. But since there are only 400 people allowed to go, your chances of getting one of the coveted spots on the day of your tour is close to zero. 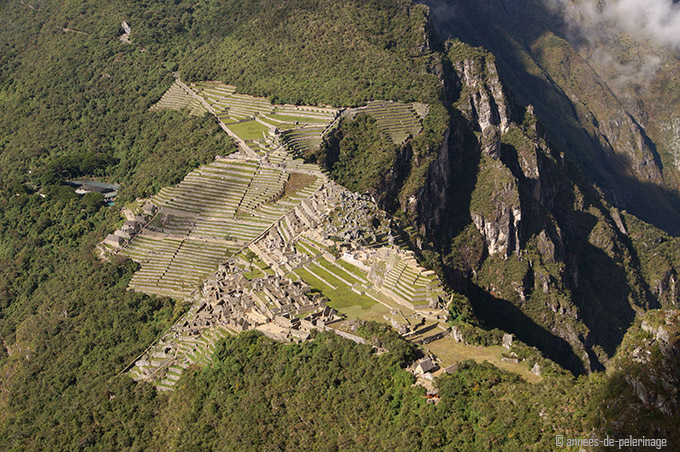 Without the tickets for Wayna Picchu, you will not be allowed in. Tickets are valid only during a very narrow timeframe 7 to 8 am and 10 to 11 am and only for one day. You will also need an entrance ticket for Machu Picchu. That shouldn’t be a problem since you can’t buy them separately. There is also a host of booking agencies littering the web. They’ll have nice and wonderful websites for lazy tourists (unlike the official website). Most importantly they are in English. But in 2017 the official website finally offered a translated mode, so there really is no need to go via the booking agencies. 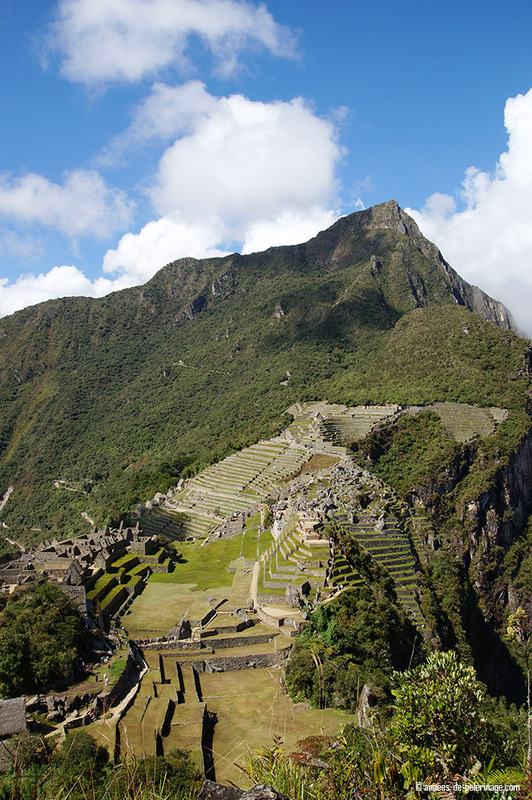 How much do tickets for Wayna Picchu cost? They will charge ~20 more USD (48 soles), but you need the Machu Picchu main entrance ticket to get in, as I already detailed out above. As they did change their ticket policy starting from January 2018 (read about it here), you might consider getting both a morning and an afternoon ticket and maybe even go on a guided tour. You might want to check out my article on the weather in Machu Picchu, to dress accordingly and find out about the best time to visit. Machu Picchu is, without a doubt, one of the most beautiful spots in South America. 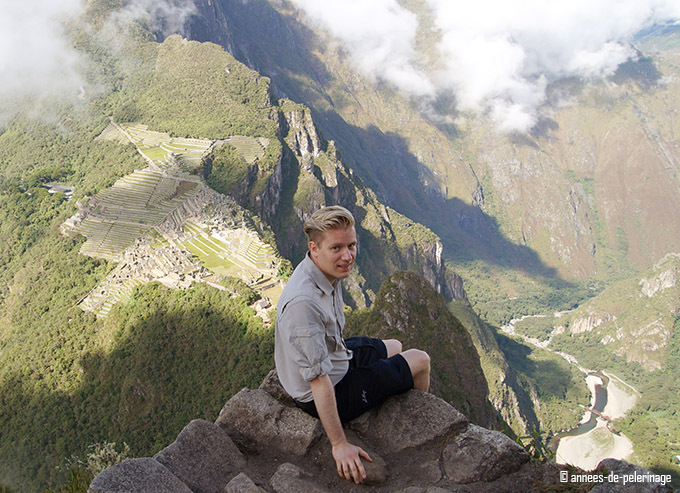 So naturally, Huayna Picchu cannot help but be an outstanding experience. It is quite inexpensive, even though tickets are hard to come by. The view from atop the mountain will be wonderful, but due to its sheer height, you will be considerably far away. Then there are the Stairs of Death – both an experience and a demand on your body & will. Would I go again: a clear no! I absolutely enjoyed it once, but facing all those steep stairs again would be too much for me. I’m glad I survived the one time! How about you? Go or skip? Tell me in the comments below! Last but not least, don’t forget to pin this article to your Pinterest board! Wow, it sounds like a pretty tough hike, but the views look well worth it! i didn’t know you could climb the peak until reading this post, and I love hiking so it really appeals to me! The steep steps look pretty scary, and down is always worse than up! 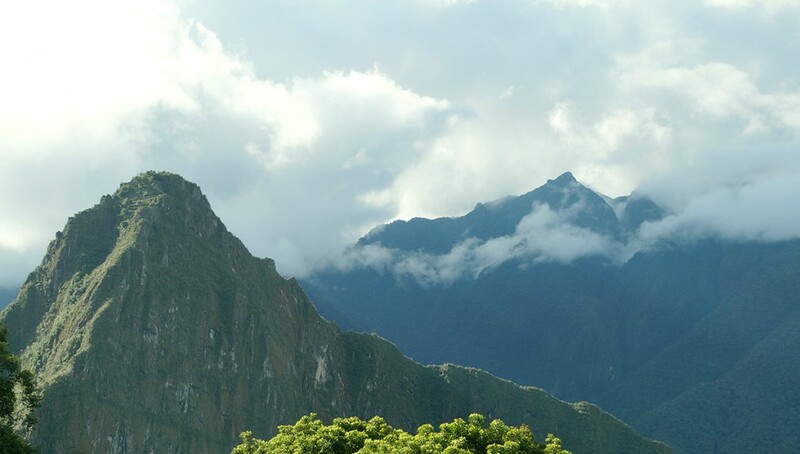 I’m definitely going to hike it if I go to Machu Picchu though! Great article. Honoust and real with good pictures to back things up. I didn’t know it was that high and you could hardly see MP below. Im no way near fit enough and tough enough to climb it. I’m opting for the hill towards the sungate but I’ glad nobody is checking six packs at the gate. Come to think of it: do they ever do that anywhere besides the gym. Lol. Yes Naomi, the sun gate really will be fine to enjoy a good view on machu picchu (only partial view though). Will take you about 30 minutes and only the last 100 meters are a bit more difficult. My wife and I hiked Wayna Picchu a few years back on our honeymoon and were unaware of its ‘hike of death’ nickname at the time. We are experienced hikers and took it seriously, which was a good thing because it is no joke. There are exposed blind corners where some other unsuspecting hiker can knock you into oblivion and plenty of steep, crazy stairs and ladders with juxtaposed angles that would give MC Escher the headspins. While on top, we witnessed a hiker frozen on a cliff in a panic attack who had to be rescued by other hikers. It is beautiful, just take your time and be careful. I do not agree there. We have tickets for next month for MP + Huayna Picchu, but after doing a lot of research on the internet we decided against doing the Huayna. We will try the Huychu Picchu instead. Thank you for all this information, showing us ‘the dark sides’ as well! Thank you for this article very useful. I am a bit in trouble becauseI was stuck with exams these last week and there is no more ticket for Macchu Picchu + Wayna Picchu for july, do I need this ticket to climb the Huychu Picchu ? PS : no other way to have the tickets than online right ? You absolutely need tickets to see Machu Picchu. You can’t get inside without them, neither can you climb Huanya Picchu, Machu Mountian or Huchuy Picchu. No ticket, means no entry. As for availablity: Yes, usually no tickets online, just means that, no tickets. I would contact some pervuvian travel agencies and ask them if they can provide you with Tickets (though they are all personalized, so I dunno). If you really can’t get a ticket for Machu Picchu, you could still visit the other fabulous Inca Ruins in the sacred valley. Piscac, Ollantaytambo, Morray, Tipon, Maras Salt mines – there is plente other spectacular stuff to see there (though MP still stands out). Hope that helped a bit at least. Ah sorry Lauriane, I did indeed misunderstand you. 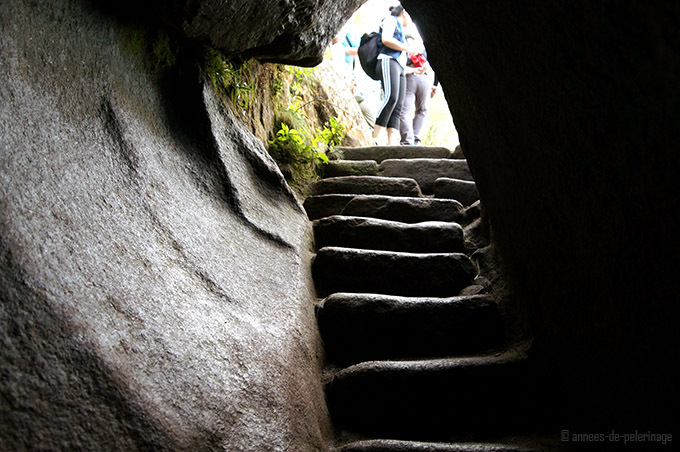 Access to Huchuy Picchu is only via tickets for Huayna Picchu. 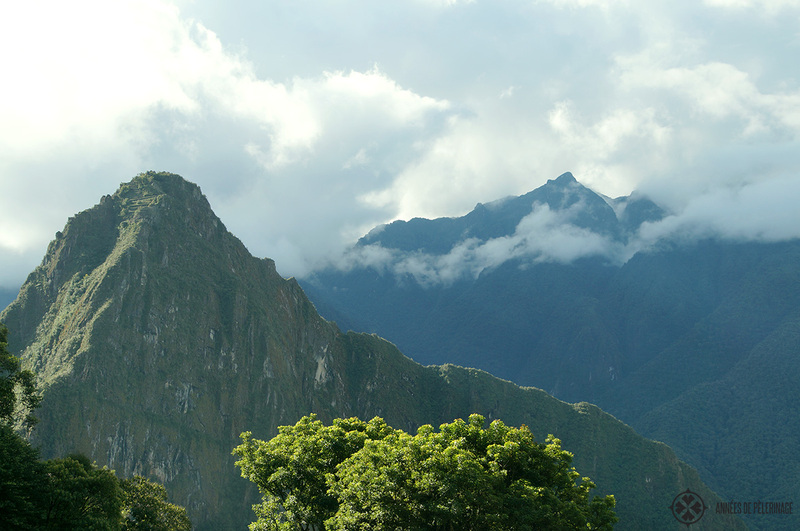 If you pick Machu Moutain (“la montana”), be aware that hiking it takes considerably longer. As for taking photographs. The sun will be behind Machu Picchu the whole day, so the view from the top of Machu Mountain will be spectacular, but you will be photographing against the sun (which is not so good). My granddaughter is just home from Machu Picchu and I’ll soon see her pix and hear the stories. I’m glad she and her fiance made this trip, but I’m happy to stay home and look at pictures. They’ll have memories for a lifetime. I really enjoyed this post and congratulate all who make the trip! 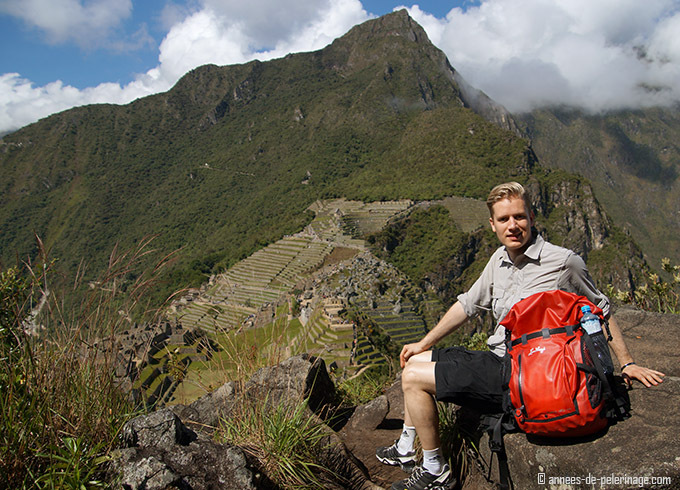 Excellent article and advice to climbers of Wayna Picchu. Thank you. I climbed that mountain last Thursday 15-Sep and it definitely is not for the timid. There people of ages 18 to 70 on the mountain, each going at their own pace. The experience is sublime and the rewards of the views and sense of accomplishment once you are back at the gate are unforgettable. I took pics and videos on the way up and down and will post my climb on YouTube within a few days. This is a great article. I just climbed Wayna Picchu and I shouldn’t have. I’m clearly out of shape (took me close to 1.5 hours to summit, 3+ hours rt, and 2 days later I’m still extremely sore) but the view was amazing. I would not recommend to anyone who isn’t physically fit ( think: stairmaster for 1.5 hours on the hardest setting), scared of heights, has vertigo, or without sure footing/good balance. And I would definitely recommend preparing before hand. I didn’t have proper foot wear either. That said, it was one of the most rewarding experiences of my life. Be prepared. Take your time. Enjoy the view. Thankful I’m back down safely. Happy trekking! glad to hear that all the sweat paid off. But I agree, do prepare well and it’s going to be manageable! I am a 70 year old woman that lives in the middle of Nebraska (no hills to climb).I went to Peru on a church trip and signed up for this hike. I’m glad I did not see your article before hand. I was worried about altitude and fitness (I go to the gym twice a week). The hike was very hard even with walking sticks but the satisfaction at my age of making it was well worth the pain!!!!! And yes the walk down was the hardest especially if you have any trouble with your knees. Thanks for the memories. Oh wow Linda! 70 years and still fit enough to brave this hike! that’s awesome. Glad you think that the the view and satisfaction was well worth the pain! Bonjour, merci pour votre article (je peux lire l’anglais, mais pas l’écrire…). J’ai maintenant peur, je veux aller monter le wayna picchu avec mon garcon de 8 ans et ma fille de 12 ans… mais est-ce trop jeune? J’ai grandi dans les Alpes allemandes. J’ai commencé la randonnée à l’âge de 3 ans. Je pense que 12 est tout à fait correct. Mais seulement si elle a une certaine expérience avec la randonnée. Est ce qu’il y a d’autres sentiers que ‘climb of death’, ou tout le monde doit passer par là? Je crains qu’il n’y ait que cette seule voie. just curious…may i ask why no food is allowed during climbing? Thank you for the article, we are going to MP next week! We have tickets to climb Huayna, but I’m having a hard time deciding between Huayna and Machu Picchu mountain… have you climbed Machu Picchu mountain, and if so, how does it compare? We live at altitude in Colorado and have climbed a couple of 14ers, so altitude should not be a problem. I do worry about the vertigo aspect as I am afraid of heights, but can push myself if I know I have to. But what I really want is the best view/photo ops–if Machu Picchu mountain is better for those, then I think I would definitely prefer that hike! Thanks for your help! The Machu Mountain is fairly similar all things considered, but not as steep at the very top (so there are no stairs of death – the hardest 100meters at the top of Huayna). Hiking Machu Mountain takes longer as well. If you want pictures, then go for Huayna, as the sun will be in the back of Machu Picchu, meaning behind Huayna Picchu, throughout the day. So from Machu Mountain you are photographing against the sun. Also, Huayna, is not as high, so you don’t need to bring too big of a telephoto lens. And you got the option to climb Huchuy Picchu as well, which is considerable closer and so much better for taking pictures. Yes, it does help, thank you so much! I climbed it. Sooo glad I did not know what was coming to me that day. Loved it. Hated it. Proud to have survived it. Never ever would I do it again!! Sylvia and I found your post very useful that we’ve mentioned you in our blog Nature’s Pace. I, having a fear of heights , took note of your warnings and just gazed in awe! Sylvia resisted the temptation. Hey Paul! Glad I could be of help and thx for linking my content! And you are right, if you prepare well, anyone can handle it! Sorry if I gave you the impression that I climbed the stairs of death, but I didn’t. Your step by step description and photos were sufficient to tell my senses that I wouldn’t cope. My sense of balance is not too good and i even found some spots in the citadel challenging. My sense of survival told me not to take the risk! Wow, so glad I read this! Thanks so much for the great article and the comments too. We are going in April and making the Huayna hike – I hadn’t realized it was such a crazy trek :) We are taking a 6am train up from Ollantaytambo and have the 10-11am tix for Huayna, will that give us enough time to get on a bus in Aguas? Also is heading back on a 4pm train seem realistic for enough time to hike Huayna and sightsee? One more ? How do we gauge what time to get a bus back to Aguas to get back to the train to Ollantaytambo? i’d say you really don’t have enough time! With that setup you will manage to rush through the ruins once and climb Huayna – but barely so. Why not take a later train (or better stay a night!)? with the 6 am train you can expect to be at the gates of Machu Picchu around 10 am..then you will have to rush to the entrance of Huayna (take 15-20 minutes). There is no way to gauge the time back either. There is oftentimes a huge queue for the bus, so the very latest time to catch a bus to Aguas would be 3pm. That would give you about 1 hour to see Machu Picchu itself. Wow. Just Wow. 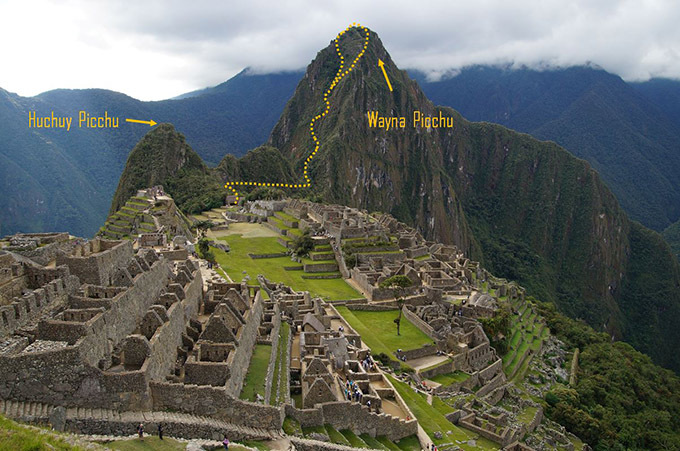 I hadn’t heard of Wayna Picchu before. Stunning, but I don’t think I could do those stairs. I could feel my heart racing from just looking at your photos and reading your words. I am glad they protect this treasure by limiting the visitors. Do you need to buy the Huayna ticket if you only want to go to Huchuy Picchu? Also, what is the elevation change to the point where the trail splits on the Huayna Picchu trail. Can you turn around at that point? Will you see anything from that point? Or is the view from Huchuy just as good. Going early November. Some travelers cannot decide between Huayna and Montana. I am pretty sure I answered all the questions in this article and the linked articles. Just read it again, and I am sure everything will be answered! I would encourage others to not be overly frightened by the “stairs of death” and “mountain of death” description of how hard this hike is. My 50+ year-old self hiked it last week with my 13 yr old daughter, along with lots of middle-aged tourists. Yes, it took some time (70 minutes up) and we stopped/were out of breath on the way. But it’s not the Bataan Death March. Obviously don’t go if you have walking difficulties, or can’t climb stairs, walk 5-10 miles at a time, vertigo/fear of heights, etc. It’s a wonderful view from the top. Hey……I’m 60 and have just climbed it. Yep it’s definitely steep and scary but if you just take your time it’s amazing. I got up in just under an hour with the scary climb down taking one and half hours as I also stopped for photos. I also used poles. Yes they were cumbersome at times but I really needed them. It is an awesome achievement once done. My husband, daughter and I are planning a 2018 trip. I’m on the fence about Waynu Picchu. My daughter is pumped so my husband will climb as well. How long did your climb take? 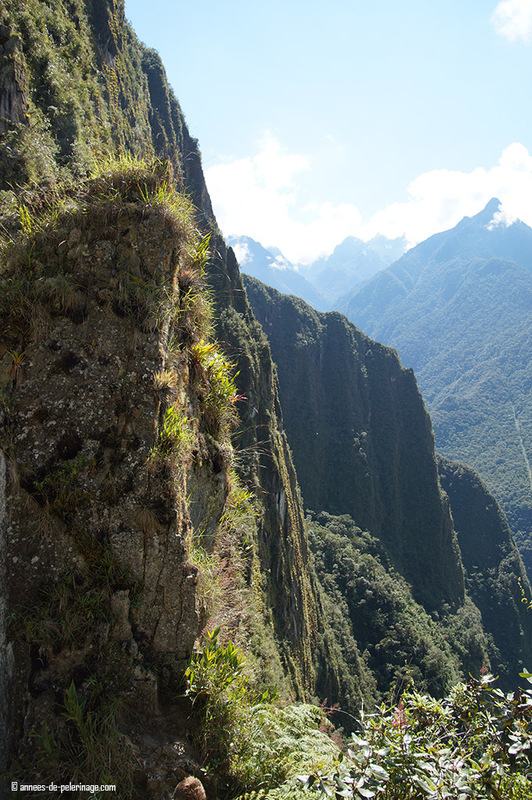 Did you also hike the trail in to Manchu Picchu? I’m wondering how I’ll be feeling after a 4 day hike into the site. So glad I read this! 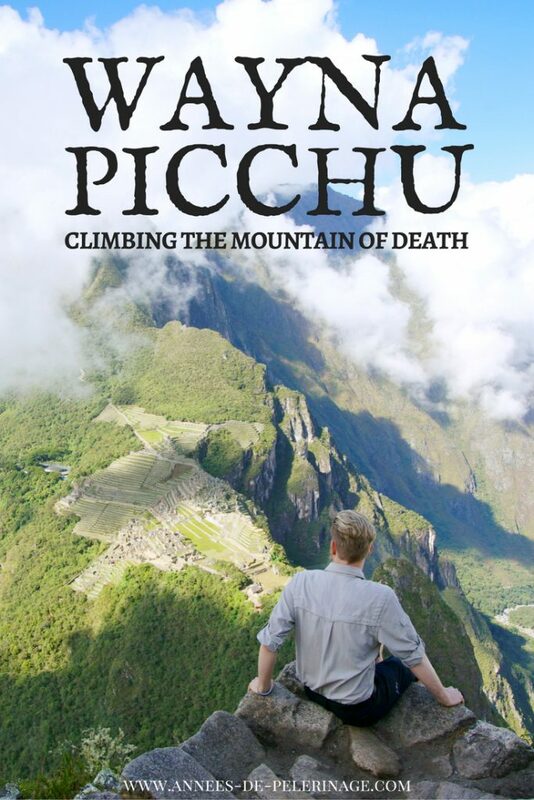 I will certainly be sticking to Huchuy Picchu as I am petrified of heights and those stairs look insane. I’m planning to go next month. 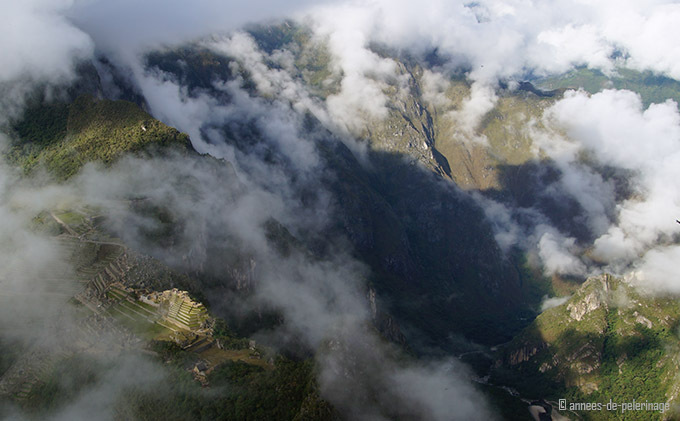 Do you know if Drones are allow to fly over Machu Picchu? actually, I don’t know. I KNOW that aircrafts are not allowed over machu picchu. But don’t know about drones. Maybe if you got a permit. Do you know how long in advance tickets go on sale? We’re planning a trip in June and I would like to get tickets to hike Wayna Picchu. When I go to the linked site it only has tickets available through January 2018.
tickets will go on sale on January 31, as far as I know. So, no worries ? My son and I climbed Huana Pichu Christmas morning 1968. There were only two other people on the mountain at that time. We sat on top for about an hour and enjoyed the other mountains as they came into view as the fog lifted. If you get a chance to go – do it! Thank you so much for your informative posts. We just returned from our trip and the four of us– in our mid 60s, in moderately but not super-good shape, had a great time climbing Wayna Picchu. When we looked at it from the bottom we kind of freaked, but we went slow and made our way up. Three of the four of us were happy to have a hiking pole. (I had a bad experience with them once and so never use them). We were glad that we were able to go early in the morning, having stayed at the Belmond Sanctuary Lodge, as it was quite warm by the time we got to the bottom. In addition, since my old hiking boots were the heavy, winter type, I followed your footwear suggestion, and purchased the Adidas Terrex Swift, and they were the PERFECT shoes, so comfortable and supportive! you can’t imagine how much your comment means to me. I’m so glad I was able to help you enjoy your trip to Machu Picchu to the fullest! Really enjoying reading your informative and honest posts. 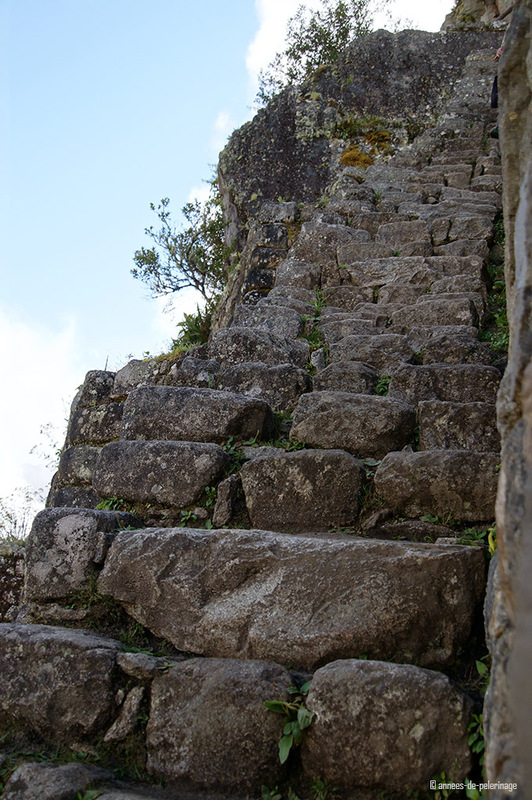 We have Machu Picchu & Wayna Picchu tickets for next month but after reading the posts and seeing those scary stairs I’m thinking twice about Wayna Pichu. 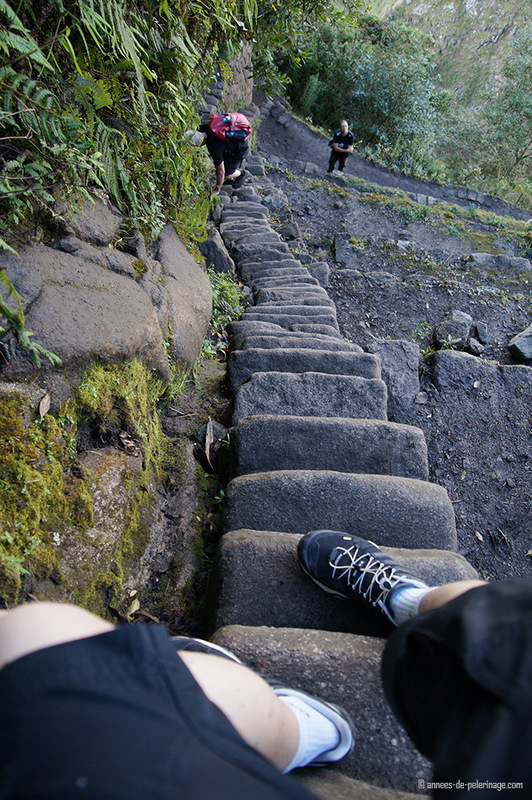 Will we still have to endure the “stairs of death” if we only do Huchuy Picchu? no, the ascend to Huchuy Picchu is fairly moderate and very short. So there are like 2 spots where it gets a bit tougher, but nothing compared to Wayna Picchu at all!